This is a great shed. Looks appealing to the eye and super functional. Took 2 people 3 hours to put together. Does need to be put on a level foundation. Plenty of room for riding lawnmower and all yard tools. 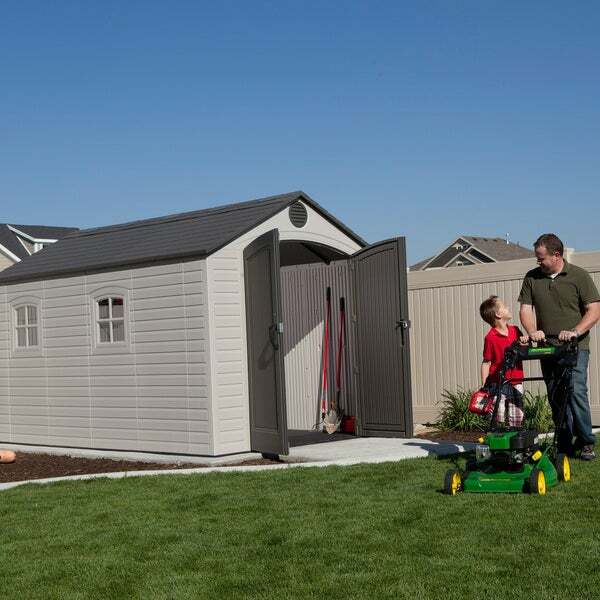 Store your yard care equipment and supplies reliably in this Lifetime outdoor storage shed. This shed features two sliding windows with upper skylights to allow in ample natural light along with gable vents that promote airflow and prevent the build up of harmful fumes. Click here to download the assembly instructions this item. 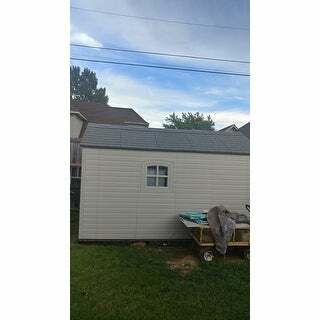 This shed is USA made and once assembled is quite strong and doesn't wobble even though it is mostly made out of plastic except for for the metal roof trusses that connect the side walls to each other. Having the floor on a level surface is very important otherwise the wall sections will not line up with each other and the double door will not line up with the opposite door. This also causes the locking latch to not work. I have quite a bit of building experience and yet it still took between 4-5 hrs with two of us to put this structure together using a screw gun. Make sure the torque setting on the gun is not set to tighten the many hundreds of screws to tight otherwise they will strip out the plastic they fasten into. Snapping the walls to the floor was a bit of a workout. Especially the corner sections. Definitely use the 1x4 piece of wood they supply to put under the taps where the wall section snap into the floor section. The plans were fairly straight forward with good diagrams and is necessary follow the order of the set-up exactly how they recommend it. There are not shortcuts to this process. The description doesn't mention that it also comes with one long shelf, two small shelves and two corner shelves. The color is not quite the same as the photo. The walls are more of a medium cream color and the doors and roof are more of a light chocolate brown. One last thing.... this shed weighs close to 700#s. It comes in two boxes by a common freight carrier. It would be very expensive to return it!! Make sure you have done your research well and are ordering what you want. Otherwise this shed has plenty of room inside, with two windows that open to allow air to circulate through the upper vents and skylights that help bring in natural light. 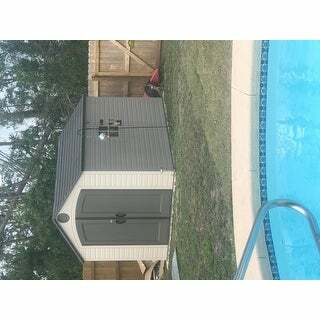 This shed was shipped to me super-fast, and it arrived only 6 days after it left the warehouse! The instructions recommend 2-3 people to put the shed together, and the use of a 6' ladder, but I (38 year old woman, only 5'4" tall) was able to put it together single handedly with just a step stool! The step by step instructions were very easy to understand and follow. I was able to construct it in a day and a half, and it would have been a lot faster if i hadnt decided to paint the roof panels white. I decided to do this after reading the review of another person, THANKS! Living in the southwest I know this will help to keep the interior a lot cooler! I would recommend that if you are doing this solo, start from the back gable and work your way forward with the roof, putting the doors in nearly last, this will help stabilize the structure and make the doors less wobbly when putting the front gable on (the front gable holds the doors in place). All in all I am thrilled with the shed, it was exactly what i hoped it would be! It is always a bit frightening to buy something online, but spending so much sight unseen and knowing that return shipping would be hundreds of dollars, makes it even more scary. Everything about this purchase was amazing. From the info on the website to the purchasing to the shipping to the delivery to the assembly to the filling of the shed was great. It was very nice to have the entire assembly and specs available on the website allowed me to look at every step before I made the purchase. I ended up assembling a wood foundation. Concrete is the better recommended option, but it was not an option for me due to finances and location. So I got 11 2x4x8 and 2 2x4x16 which I had to cut down to 12.5' and then 4 sheets of outdoor rated plywood. Got the ground leveled and built the foundation in about an hour. Was really easy once the ground was leveled. I ended up using outdoor screws, just my thing, they say to use nails, but I have always prefered screws. Then I just went step by step. The instructions were pretty easy to understand and some of the assembly was pretty intuitive. I built 90% of it by myself, but things like putting on the doors and some of the roof panels proved tricky on my own. Also the rear right and front left corner panels were a bear to slide and snap into place. It is a very snug fit, so get an extra set of hands to help (also use the piece of wood they provide to help with this step - it does help!) I set my dewalt 20v drill to #2 clutch and found this was perfect for the screws to not strip, but get in there all the way. The last step was leveling the shed to get the doors square. This was surprisingly easy. Just follow their instructions and it works! This was an investment for us as we did not want to store our things in a storage unit, so this thing is paying for itself after just a few months. Doors are sturdy, so we get a lock on it, it seems pretty secure. This brand is a high quality and they have QR codes to scan if you want to see someone actually do the step you are on. Was very helpful as I was putting the doors together. It was a heavy item, but the delivery company was super friendly and dropped in right in my driveway. It is about 650lbs, so prep yourself for some work. My unit seems to have come with some extra bags of screws. I did not install the shelves, but they are pretty heavy duty. Hope this helps and calms the hesitant buyer. I am very happy with it. 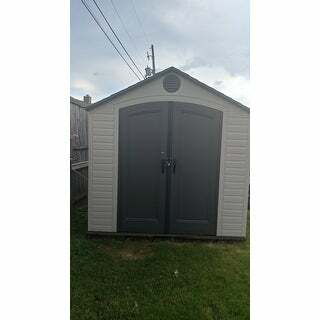 The Lifetime Grey Plastic and Steel 8-foot x 12.5-foot Outdoor Storage Shed is sturdy and durable. It holds a good amount and will last for years to come. It is a nice color and doesn’t detract from the yard. From opening the boxes to the final step in putting up this shed the excellent design of this shed came through. I researched my options and decided on this one. The directions were easy to follow, the parts all fit where they were supposed to, and the final result is water-tight (already gone through several rain storms). I would recommend this shed to anyone. Having a second set of hands is helpful at just a few of the steps (I did the whole construction by myself). Two important points: 1) Build a solid, square, level foundation (I chose the treated wood), and, 2) follow the directions exactly as written . I ordered this shed in early spring last year. It went through summer storms, heavy rain, and a hurricane. I didn't see a drop of water leak. Very easy to install. But you do need a second pair of hands. We spent more time building the foundation than putting the shed together. Had been watching pricing for this shed with various vendors. Overstock's price couldn't be beat. Delivery was as promised. Replaced an old home built wooden shed and used same wood frame base for the new lifetime shed. Assembly was as outlined in the directions but it is critical to follow each step and adhere to directions and warnings. A perfectly level platform is crucial and had some issue with it but shimming low corners provided a perfectly aligned assembly. Put up with only one person which took 2 days. After completion, also installed shelving and electric to complete installation. Also had previous installation of same design Lifetime shed (8 X 5) which still looks like new after over 3 years. The two side panels with the window were about an inch shorter than the rest which took some forcing to get them lined up with the rest and then screwed in. The other minor issue is that some holes that connect the panels cannot be tightened well... the screw just kept turning. THE SHED ARRIVED IN TWO BOXES MY GARDNER PUT IT TOGETHER, TOOK HIM ABOUT 2 DAYS BUT IT LOOKS GREAT ITS DURABLE AND THE SIZE IS WONDERFUL. This building comes in alot of separate pieces, but as long as you read the instructions carefully and have a good solid level foundation, you shouldn't have any trouble putting it together. My husband assembled this shed in 3 days, with a little help with the doors and roof--and that was working half days, so I guess full assembly was 1 1/2 days. We've already had several storms and the shed has held up quite well. There's plenty of space for storage and looks very nice. great shed some peices dont fit exact for the roof. and the corner walls are harder than heck to get in. the doors are hard to get in and stay closed. Super nice shed once it's assembled. Be sure to have a few extra hands to put it together, I wasn't aware that a wooden platform needed to be built below the structure. Nice product. Although there were many parts to assemble,the parts and directions were well organized and we were very impressed with the quality of the shed parts. The shed looks great and it has handled early snow, rain and wind well. I would recommend this product. Shed look really good. It seems to be really strong and sturdy. The color is a neutral color that will blend well with house colors without painting it. Although I have just recently intalled my shed the shed was a little hard to put together on the corners. With this said. I really like it. I was going to buy a wood shed but I am very glad I didn't. I recommend this shed . "After receiving shipment is it easily transported in the back of a pickup? I will be hauling to a remote location to install. How big is the shipment?" This will be on a pallet, the overall dimensions would be 96 x 32 x 33 in. 599 lbs. You could break the pallet and transport it per box. First box dimensions: 96 x 82 x 15 in. 317 lbs. Second box dimensions: 75 x 32 x 14 in. 223 lbs. "Does this model offer extension pieces? Or is the size what you get?" The shed is not available. "Can this shed float on "piers" or does it have to be set on a concrete slab?" It needs to be on a solid base... We did not use concrete.. although that would be good... We used shale to make it solid as we keep our lawn tractor in the shed and need to be solid. The assembled dimensions are 96 inches high x 94 inches wide x 148 inches deep. The door opening is 56 inches high x 76 inches wide. "Is there an anchor kit available for this shed?" This item is recommended to be used with 3/8 anchor bolts. "How wide is the doorway with the doors open? I need to drive a riding mower with side chute/bagger into the shed." The door opening is approximately 56 inches high x 76 inches wide. "DETAILS:.......#12596280 8 feet long by 12.5 feet wide ??? Really ? WoW ! this is not close to what the pictures display...logic as well demonstrates DETAILS MISTAKE!!! ANSWER PLEASE..."
Hello redundant00, I'm sorry for the confusion we may have caused. Side to side is 8 feet wide. Front to back is 12.5 feet long. Have a great day!